Sonargraph includes the dependencies to external assemblies (DLLs) in its analysis. The paths where the external assemblies are located need to be defined in an "Installation Profile". The preference dialog opened via the menu "Preferences..." , allows the definition of your own profiles. The definition of assembly directories is based on Groovy Templates, allowing for flexible profiles that can be shared between team members. 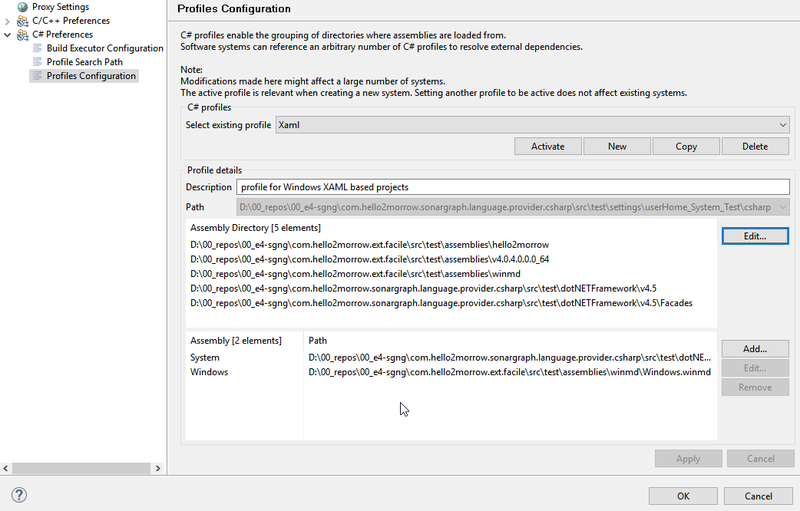 Sonargraph detects the installed Microsoft .NET frameworks and offers them as installation profiles. These profiles can be used as templates to generate new profiles. The activated profile is used as default profile for all new software systems that contain C# modules. Modifying the content of a profile that is used by the currently opened software system will force a full reparse as soon as the profile is activated or the changes are applied. As default, installation profiles are stored in the Sonargraph home directory. These profiles are not intended to be shared. If you want to share installation profiles across team members, it is recommended to specify a separate directory in the search path that contains these shared profiles. See section Section 3.9, “Search Path Configuration” .